Haydn Bunton is a true Club Legend in every sense of the word. Bunton's matinee idol looks might have seemed more suited to the silver screen, but many argue that he was the greatest player our game has ever seen. A football prodigy in his home town of Albury, Bunton quickly became the target of every VFL club. But it ended up being Fitzroy who were the fortunate ones to secure his signature and services. A polished rover, he made his League debut as a 19 year-old in 1931 and took little time to assert his authority on the competition. Remarkably, Bunton won the coveted Brownlow Medal in each of his first two seasons of League football and finished Runner-Up in 1934, before following up with a record third Medal triumph in 1936. Throughout a career which spanned eight seasons and produced only 119 matches, Bunton also took home two Club Best & Fairest awards, spent six years as Fitzroy Captain, and even coached the Club for 18 matches in 1936. He eventually departed Fitzroy in 1937 to pursue a career out West, before giving army service to his country during World War 2. 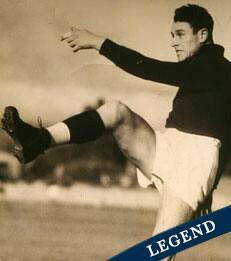 Bunton returned to Fitzroy briefly in 1942, but officially hung up the boots just two matches later. Sadly, his life was cut too short at just 44 years of age when he was tragically killed in a car accident in 1955. But in Australian Football, and at the Brisbane Lions, the Legend of Haydn Bunton will forever live on.